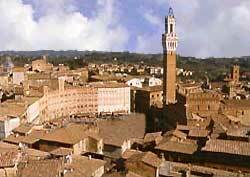 The well-preserved medieval Tuscan hill town of Siena is picturesque. And, it has a fascinating local culture that includes the incomparable Il Palio horse race. This sloping, shell-shaped square is Siena's throbbing heart and center of activity. Character-full old buildings ring the Piazza del Campo. This includes The Town Hall (Palazzo Pubblico), an architectural jewel. For a spellbinding panoramic view, climb its Mangia Tower, which soars about 100 meters (300 feet). The Piazza del Campo is best known for being the location of the Palio, one of the world's most (if not the most) thrilling horse races. Click the button below to read my web page on it. This grand cathedral is celebrated for its eye-catching belltower and marbled interior floor. Many fine Renaissance paintings hang in this museum. Narrow streets lined with medieval buildings wind through Siena.